Jan, her husband, and 13 year old boy are very busy and often very hungry. 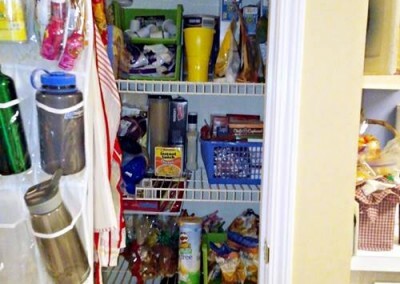 This is a shot of her pantry during my consultation. 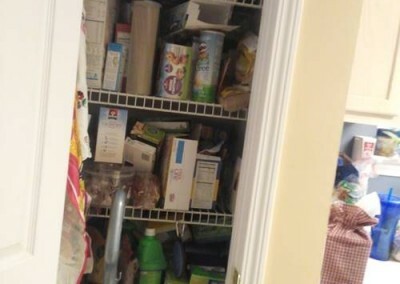 Notice all of the boxes and disorganized shelves. 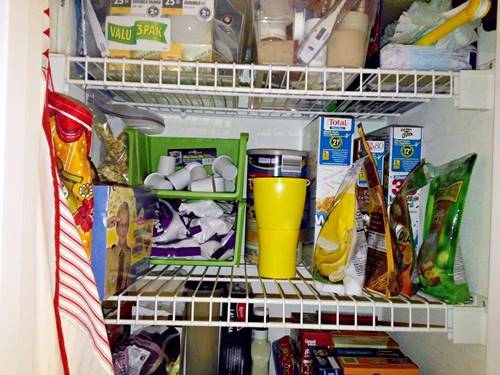 A huge no-no for pantries (especially small pantries) is storing non-food items in there. 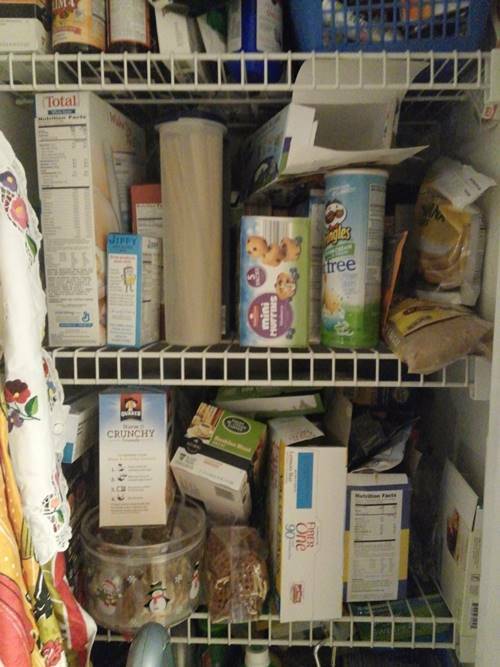 Eventually the pantry becomes the go-to storage container for all miscellaneous household items. 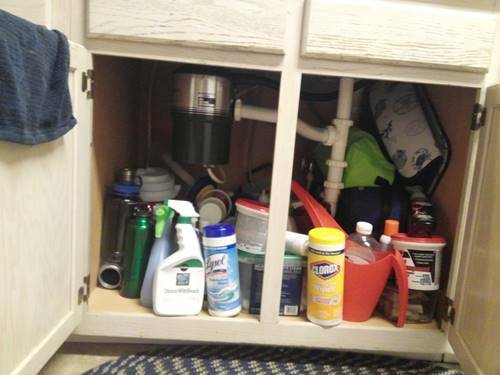 Under Jan’s kitchen sink are several other miscellaneous household items that are completely unrelated, such as cleaning products, water bottles, lunch boxes, and camping gear. Another shot of the unhappy marriage of items that don’t belong together. 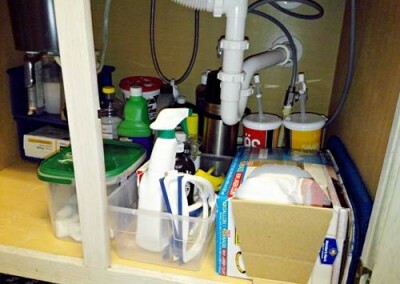 Under Jan’s sink, she had placed the items she used the most at the very front… no problem there. 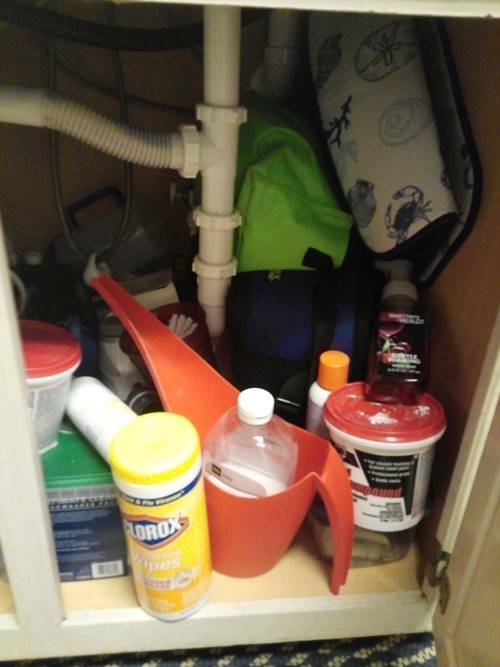 But behind all of the things she uses often is a jumble of things she rarely uses, so when she does need to find that one water bottle or that piece of camping gear that she knows she put somewhere, it’s going to be frustrating to locate it (and try pulling it out without everything else crashing down) ! 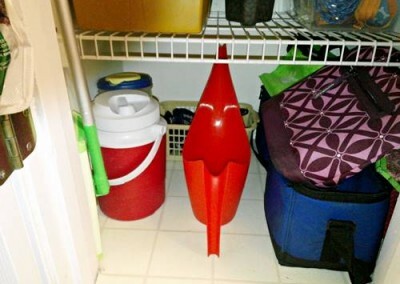 Under Jan’s kitchen sink and in her pantry, I found items that , in most homes, belong where they were. Especially for a busy family of three! 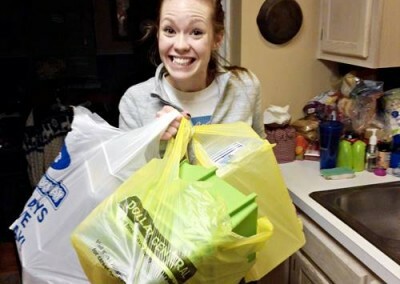 But Jan found herself being frustrated every time she needed something that she didn’t use everyday. 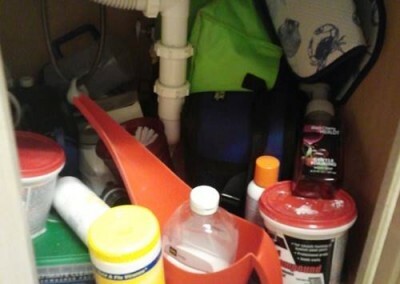 I knew my plan of action was definitely going to begin with taking everything out, purging, and condensing. 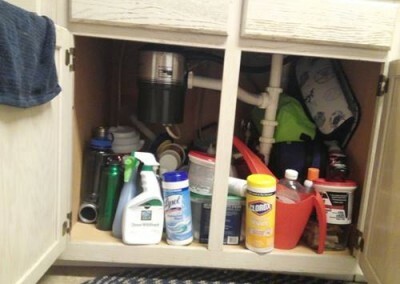 I also knew I needed to sort through things under the sink, in the cabinets, and in the pantry together because there was a lot of overlap i.e. 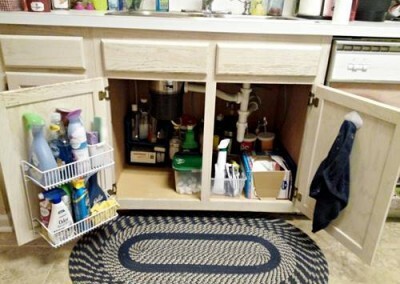 cleaning products overflowing in the pantry and under the sink, vitamins and medicine overflowing in the pantry and in the cabinets. 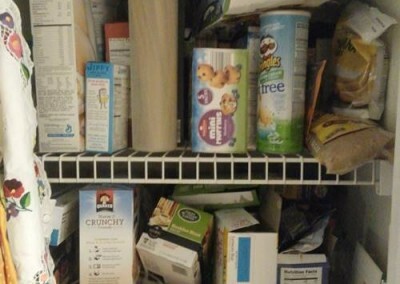 There was a lot of expired food and medicine that I was able to purge and several boxes of the same things that I was able to condense. 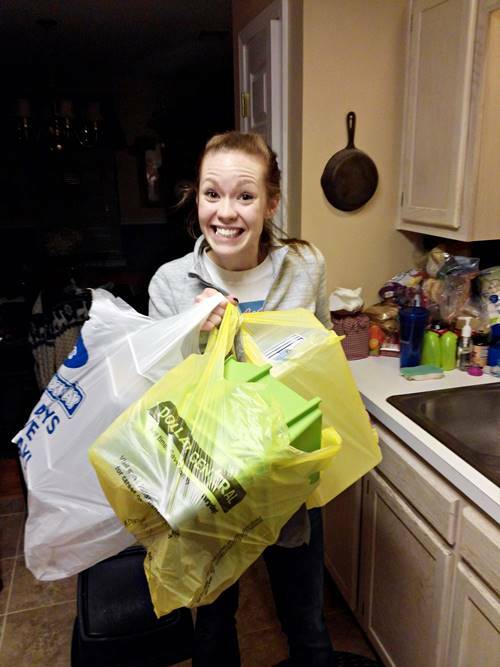 Because of my hour long consultation with Jan prior to organizing, I was not only able to determine which items were used most and was able to put those items in an easy-to-get-to place, but I was able to do all of that successfully without Jan being home! This project only took about five hours and in that time I shopped for storage materials, condensed and purged items, and put everything back. It was really a quick and painless project. 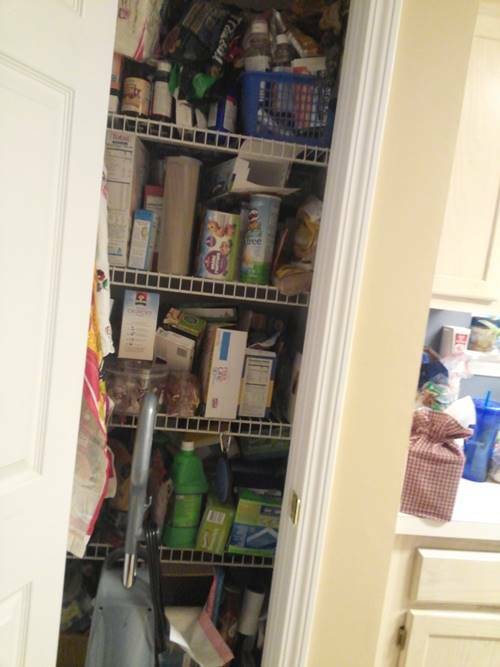 Jan wanted some things put away in containers but she wanted most things out of containers for easy access for her husband and son. All the shelves were categorized. This shelf has cereal and snacks. 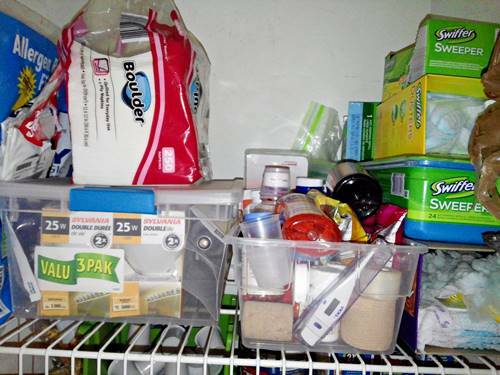 I found these great stackable open front storage containers at The Dollar Tree for 1$ a piece! 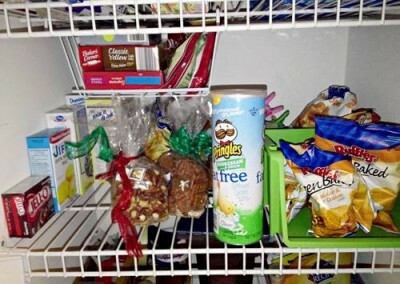 In these I have stored Keurig teas and coffees and Jan’s son’s Little Bite snack muffins. 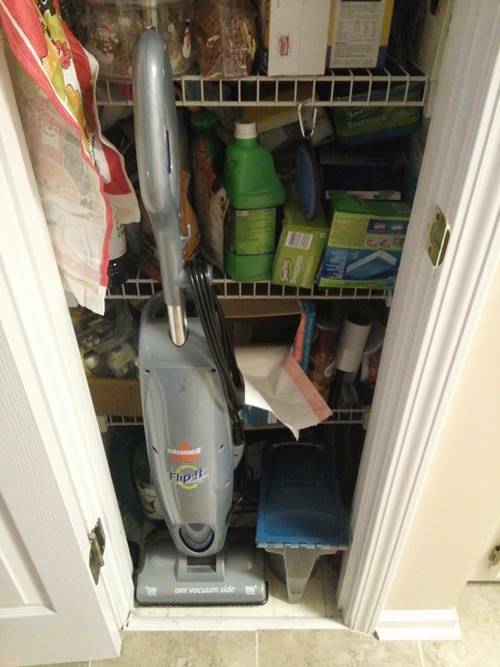 We removed the hardwood floor cleaner and all of its supplies which opened up a ton of space! 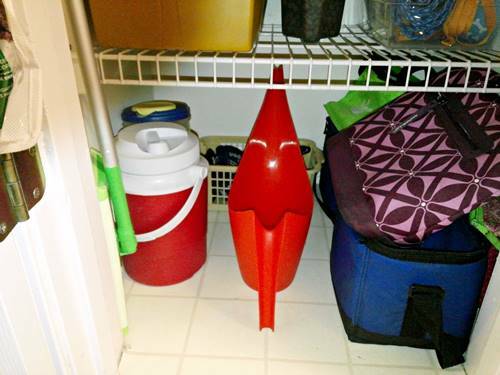 On the bottom of the pantry I took all of the lunch boxes from under the sink, a watering can, and a couple of large pitchers. 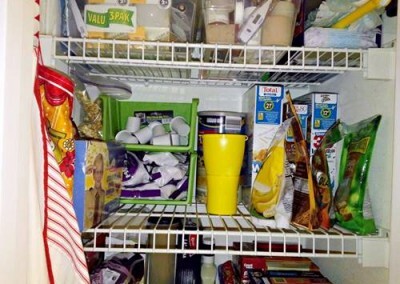 This shelf is full of chips and baking materials. 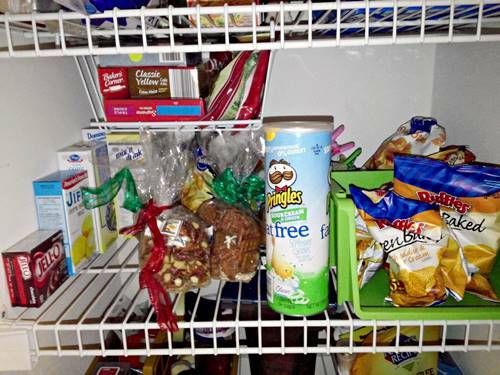 The lonely stackable container here is storing Jan’s son’s snack bags of chips so they don’t get lost with the larger bags. I also found this great storage basket at Roses for 5$! 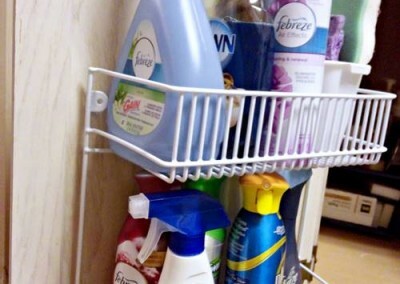 These work great for wire shelves and wood shelves! 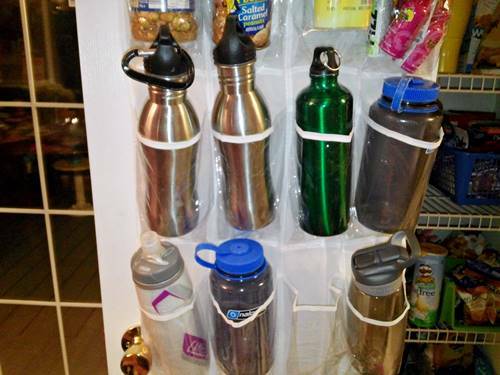 Remember all of those water bottles that were being stored under the kitchen sink? Here’s a much better option! 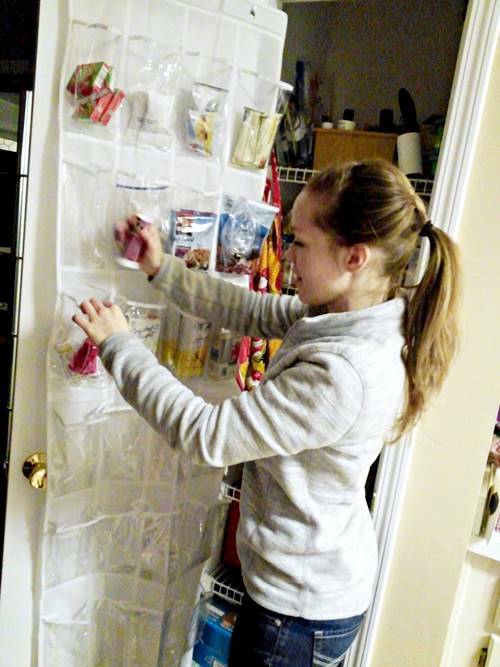 This clear over the door show holder came from Roses for 7$ and is a GREAT fix for miscellaneous items and grab-and-go snacks. 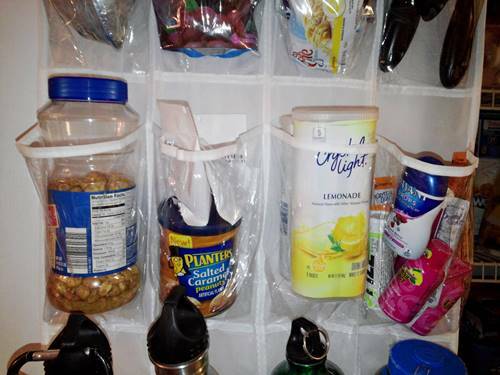 Also stored in this great shoe rack: water flavoring, five hour energy, and nuts! 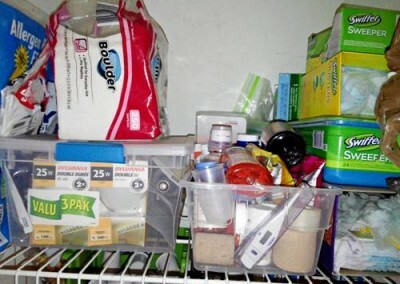 The top shelf was full of over flowing medicines and cleaning supplies. 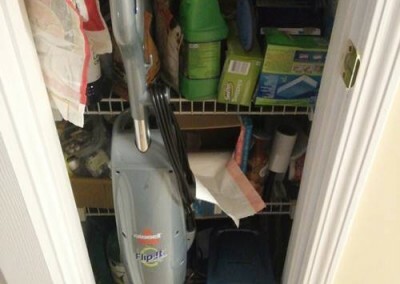 All of Jan’s swiffer materials are still being stored in the corner along with the medicines that have been condensed significantly. The other tote to the left of the medicine is full of LIGHT BULBS! I think Jan will be good illumination for quite a while. After of under Jan’s kitchen sink! 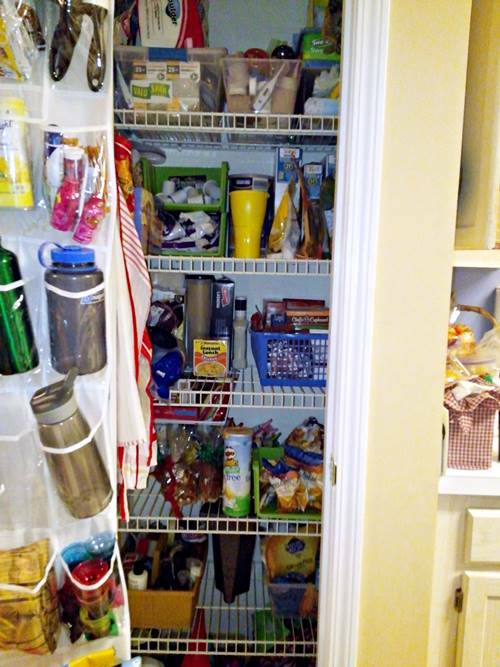 With all of those items moved into the pantry, there was a ton of space to work with here! In the very front I placed the items Jan uses almost everyday. 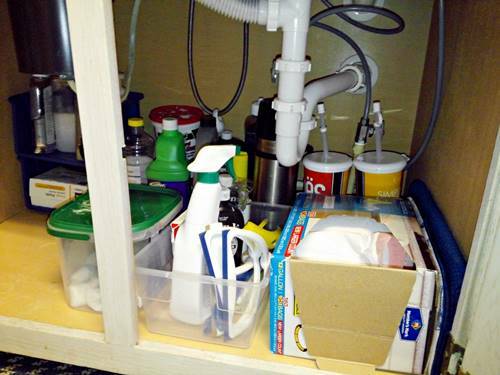 Soup for the dishwasher, garbage bags and a small bin with cleaning supplies. Also at Roses I found this great mounting storage basket. 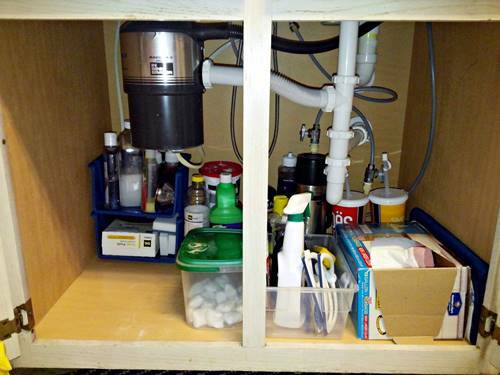 After (very easily) mounting it on the inside of the cabinet, I stored air fresheners, dish soap, and gloves. 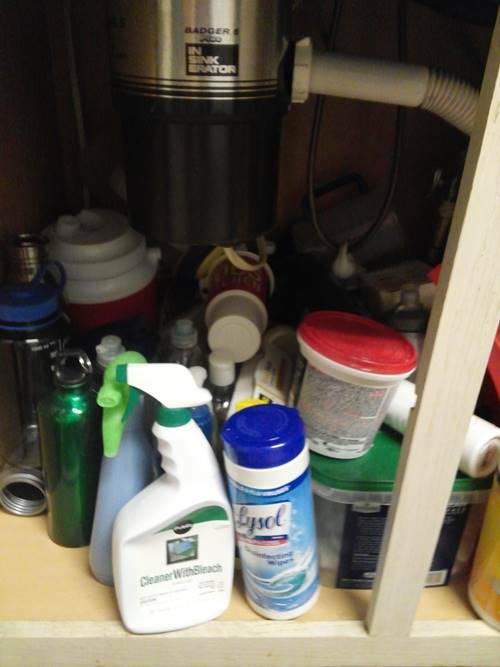 Behind the most used items are things that Jan doesn’t use all that often like camping propane, and cleaning products that aren’t often used. 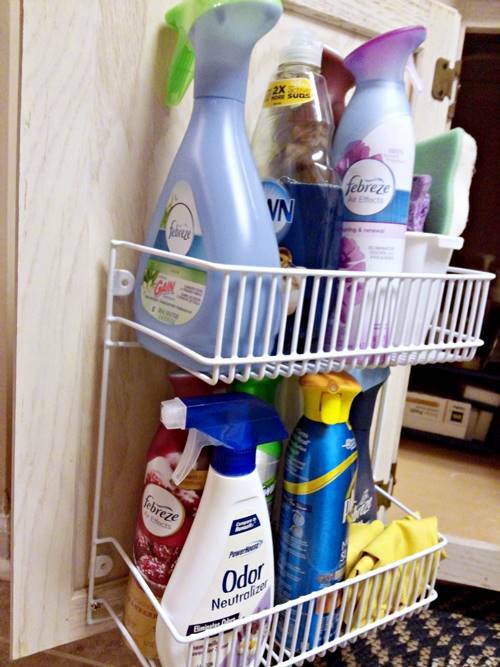 Though all of these products are still easy to get when needed. And the after shots! It doesn’t look super fancy but it is incredibly functional and is a huge step up! I did a lot of purging and condensing. I bought some really inexpensive storage solutions. 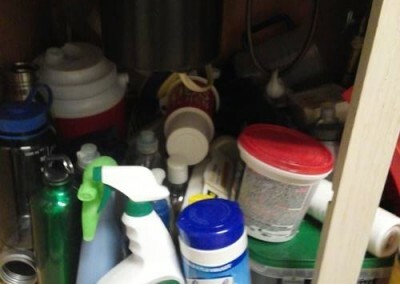 And I categorized all of the cleaning products, food, medicine, and miscellaneous household stuff. Easy! This project isn’t actually complete though! I found a great idea for boxing in the wire shelves in the pantry, so I approached Jan and we are booked to do it! Boxing in the wire shelves will definitely increase the functionality of the shelves but mostly… it’ll just look a lot prettier! This project took two days to complete for a total of 5 hours not including shopping time. 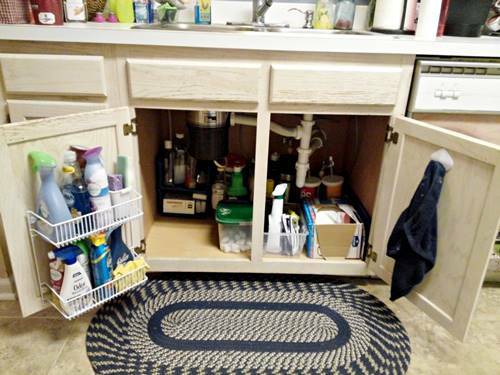 With a project cost of 40$ (kitchen pantry = 20$ + kitchen cabinets and under sink = 20$) and the additional 4 hours on the job, this project cost Jan 130$ including the cost of materials. Send me an Email or Give me a Call to Schedule a Consultation Today! And be sure to follow me on Instagram @kesslerorganizeddesigns to see all of my Insta-Projects as they happen and while the project is on I will be on stand-by answering any questions I receive on my Instagram photos!